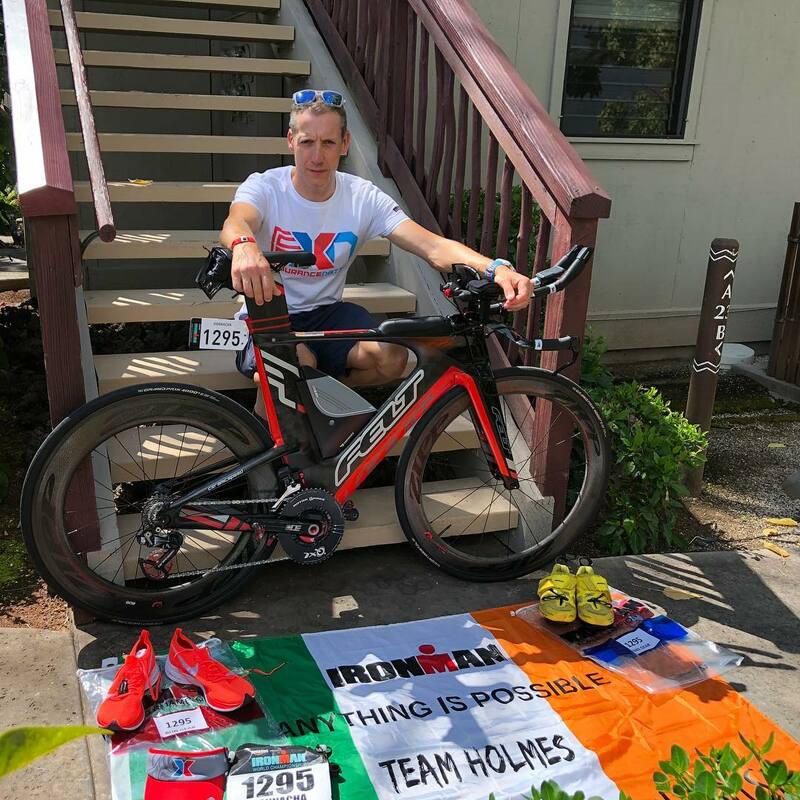 While most of us were fast asleep, Carrick-on-Shannon's Donnacha Holmes joined a very select group of athletes when he completed the famed Ironman World Championships in Hawaii in the early hours of Sunday morning, thus becoming the first Leitrim man to do so and at the same time producing the performance of his career so far. 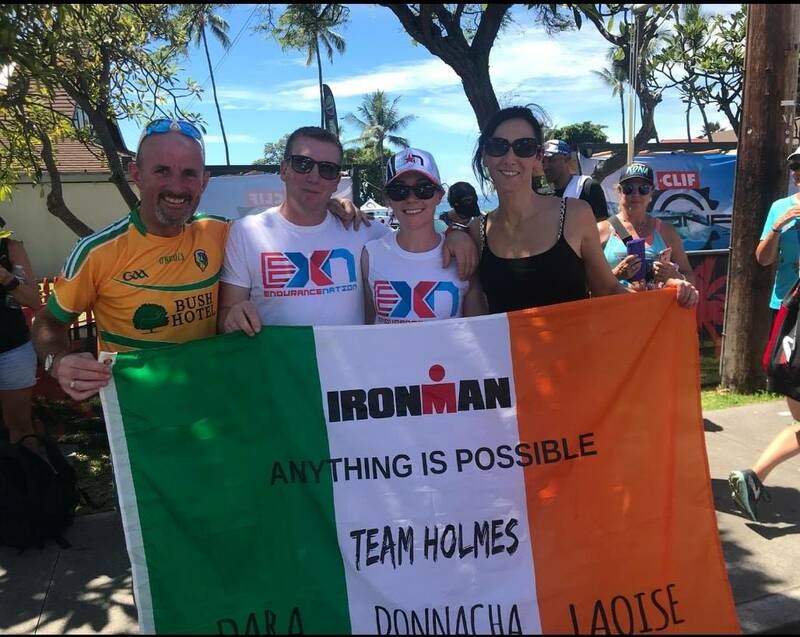 Donnacha completed the legendary Hawaiian Ironman course in a time of 9 hrs 25 mins 16 secs, a fantastic time considering that the Kona course is known as an extremely testing and demanding course with a mixture of high temperatures and strong winds on an exposed island. Donnacha finished 327th overall out of 2,378 finishers and 42nd in the Men's 40 to 44 year old category while also being the 303rd male across the line on a day when the course record was smashed by Patrick Lange of Germany with a time of 7 hrs 53 mins. He covered the 3.9km swim in a time of 1 hr 05 mins 30 secs, averaging 1 min 42 secs per 100m. A quick transition of 3 mins 50 secs saw him hop on the bike for an incredible 180 Km journey that he covered in 4 hrs 52 mins 09 secs for an average of 37.1km per hour. The final transition took 4 mins 56 secs before starting off into his full 26.2 mile marathon which he covered in 3 hrs 18 mins 22 secs, an average of 7 mins 30 secs per mile, a truly outstanding performance. Speaking to the Leitrim Observer from Hawaii on Monday after his race Donnacha reflected on what was an experience of a lifetime. “There was an amazing atmosphere and build up all week leading into race day. The streets and highway were full of athletes preparing. It had a real sense of a special race and every athlete looked in incredible shape. Regarding the 3.9km swim, Donnacha said “A much higher percentage of age group athletes are of the same swim ability out here making for a very rough & crowded swim in choppy and large swell conditions. Usually it spaces out as the swim goes by but not here. I was happy with my time and to make it out relatively unscathed. “Madame Pele, the local Hawaiian goddess of fire & volcano was truly kind to us on Saturday. The winds were relatively light in comparison to other years and while still a little gusty I battled through the tougher sections staying on my numbers and holding really good pace. “At the turnaround at Hawi at 96km I was in really good shape, my plan was going great. A long and fast 70km per hour 20km long descent from Hawi before we re-joined the Queen K highway and back to Kailua for the Run. “I tucked in as aero as I could and conserved my legs for the 40km headwind section that awaited me out on the Queen K. With a bit of Irish luck the feared headwind was more of a sidewind and so I quickly realised that I could make more time than I had planned for so I did some quick maths, reset my race plan numbers and got to work to make some bonus time. “I had flown out to Kona 11 days before to acclimate to the extreme heat and humidity. From my training testing out here I was losing over 1.5 litres of sweat every hour while at pace. Drinking, refuelling and replenishing those fluids were an essential part of my plan so at every on course aid station I would take a cold bottle to drink. “Before I knew it I was racing hard adjacent to the Airport, nearly with only 10km to go and I was feeling really good, fully hydrated and ready to Run. A 4:52 bike and I couldn’t have been more pleased. With the realisation this day could be special I had an determination to make it happen. “‘After training out here in the lead up to race day I knew the Marathon was going to hurt like crazy so I planned to hold back a little more than usual on the bike so I could give myself a better chance to run in the extreme heat of the day and keep my heart rate and core temperature down as best I could. “After 3km on the run my legs came online and I was feeling really good. The first part of the Run on Alii drive was a really hot out and back section of 12 km but my heart rate was holding steady and my pace was holding strong so I was in good shape. “As we made our way out along a windy Queen K highway and into the Energy Lab I was still finding good pace and still passing a lot of guys the whole way in & back onto the Queen K.
“With just 8km to go my body was beginning to scream stop and my legs were sending extreme pain signals with every step. I battled on as best I could and with the help of a Welsh competitor Chris, who was equally in as much pain, he had done the maths and gave me a few words about making a sub 9 hr 30 mins overall time at this pace. “So with a new added determination we paced off each other to get us home. I finally made the turn off the Queen K and onto the steep downhill of Palani and I knew I was going to make it. 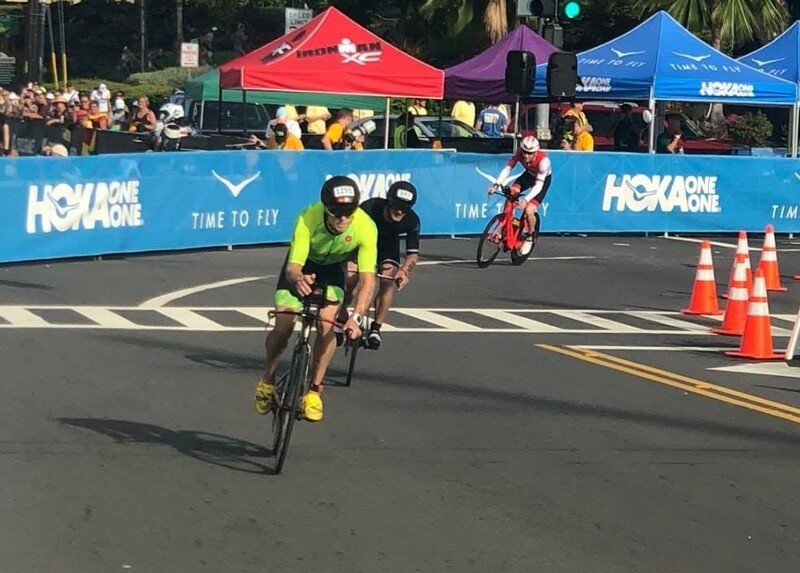 “As we turned onto Palani I could see ahead of me and moving slowly was fellow Irish athlete & overall Irish Ironman legend Owen Martin on his way to his 9th World Championship race here in Kona. “I caught up to him and we were side by side for the entire finishing chute. We chatted briefly about an epic day and how we both had had a great race. It was like we had planned it as our families & friends were along the magic carpet finish holding Irish flags on both sides of the finishing chute. “We each caught a Tri-colour and holding them above our heads we crossed the line together and turned to hug each other and congratulate ourselves on a super race and a day I’ll remember as long as my body is going. “As the days post-race go by I remember a few more nuggets of memories and moments from the day. I couldn’t be happier with how the day went. I’ve read about it and heard it said that this race deserves respect and I feel that helped me have a great race. Donnacha finished by thanking everyone who got him to the start line in Kona for a truly memorable experience and performance - “Thanks to all my family & friends for their huge support over the past few weeks. I’m truly overwhelmed by the huge amount of messages and we’ll wishes I received and continue to receive out here.